Condition: Used Consignment item being sold from our warehouse on behalf of owner. Please request details. Product Description Features a unique, high performance oven with the fastest combined heat up and cool down rate in a conventional GC oven design. The resulting shorter injection-to-injection time will significantly increase your throughput and productivity by speeding your analytical cycle time. - Accommodates three syringe sizes (0.5, 5.0, & 50 uL) and three injection speeds (slow, normal and fast) for complete application flexibility. - Unobstructed access to both injection ports permits any combination of analyses for the most efficient utilization of the gas chromatograph. - Fully controllable from the Clarus 600 GC touchscreen, featuring run status and automation logs that show whether there was any deviation from the preprogrammed method conditions. - Optical sensor consistently monitors system integrity. The Clarus 600 inlet positions are programmed with a range of temperature-programmable inlets. Options include two enhanced capillary injectors: programmable split/splitless and programmable on-column. - Significantly reduce risk of sample degradation, thereby maximizing accuracy and precision over a wide range of sample volumes. - Prevent contamination of gas lines and regulators with the PSS system's integrated charcoal trap. This GC has an FID detector. Software CD's are included. 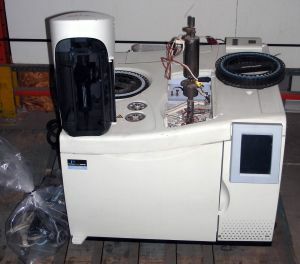 Built-in autosampler. **This item is being sold on consignment (it's in our warehouse, but we are selling it on behalf of its current owner). We are selling it AS IS (no extensive testing, no overhaul but we will perform minimal testing upon sale). Upon receipt of the GC, you will have 30 days to test the unit and return it for full refund (less all shipping charges) if you find it to be functionally defective. This GC has an FID detector. Software CD's are included.